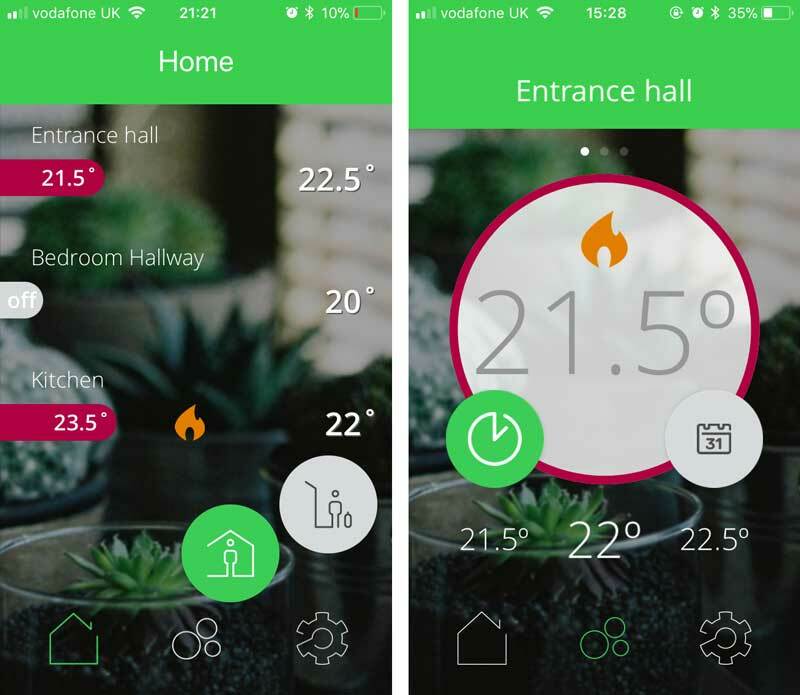 The recent launch of the Drayton Wiser from Schneider Electric was the trigger for Automated Home reader Mark Boyle to bite the bullet and install a smart home heating control system. Why Did We Need Smart Heating Controls? We live in a 1970’s bungalow that we renovated and extended in 2008. When installing a new heating system we split the heating into three zones, one for the living end and one for the bedroom end of the house. The third zone was for water heating. This gave us a level of control around heating areas of the house based on occupation patterns. The heat source was an oil-fired boiler which was replaced by a biomass wood pellet boiler in February 2016. 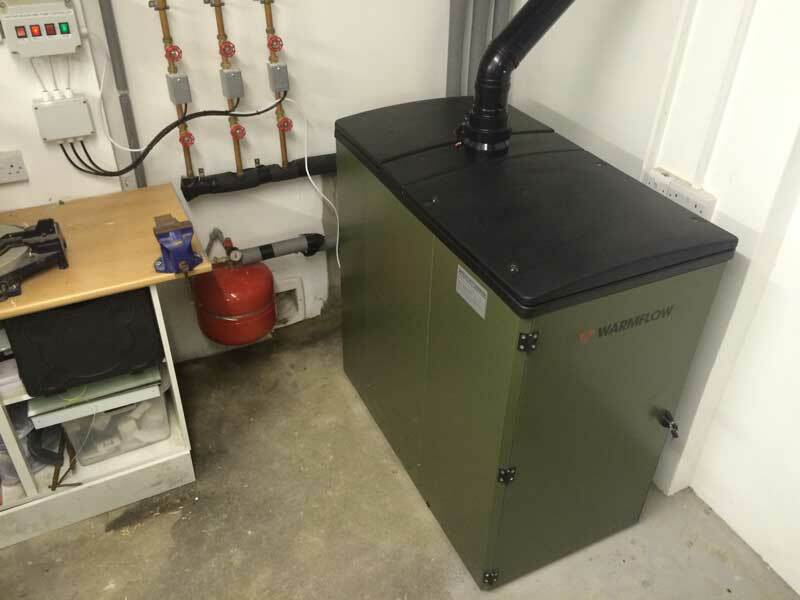 Picture: Warmflow WP18 6-18kw fully modulating wood-pellet boiler with 3 zone valves visible. The system was controlled by a Horstmann H47XL 4 zone programmer located in the utility room that allowed 3 ‘on’ periods over 7 days. The 4th zone was used as a time clock for a range cooker, this is independent of the heating system. The living zone and the bedroom zone had 2 Horstmann DRT1 thermostats and the hot water zone has a cylinder thermostat. Picture: The conventional 4 zone programmer with advance and boost buttons for each zone. Within each zone are the very distinct heating characteristics of the different rooms, some are constructed to 2008 building insulation standards whist some are from the ‘70’s. Some have a large area of glass and can go from hot on a sunny day to cold at night quicker than other rooms. Achieving a consistently comfortable temperature balance between rooms is impossible with only two heating zones and conventional TRV’s. The ability to tailor the heating schedule beyond the 3 periods allowed by the existing programmer as occupation habits have changed. Wiser allows 8 set points per day tailored uniquely per day if necessary. Set points can be set to desired temperature levels or OFF. On occasions when someone wanted a warmer room they would have to go to the programmer to ‘Boost’ the heating and then check the thermostat to ensure it was calling for heat. 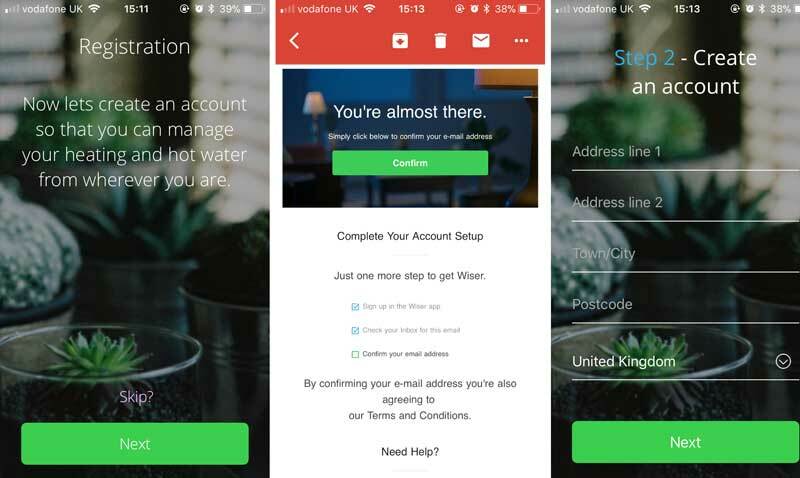 Boost can be completed from the thermostat or from the Wiser app on our mobile devices. The wood pellet boiler takes much longer to achieve its maximum heat output compared to the previous oil boiler resulting in programming a warm up period in the heating schedule. The Wiser system learns the time taken to reach the set temperature and can compensate for the heat up time of the boiler. The new system should be a drop in replacement for the existing system with minimal reworking of existing wiring and controls. The Wiser system came with a three channel Heat HubR which would fit our needs perfectly. The system should be scalable and allow the control of heating down to a room level for additional comfort and efficiency savings. The Wiser system can accommodate up to 32 devices across 16 zones (rooms). This could be a mixture of room thermostats and smart TRV’s. The system needs to provide a good return on investment. The three channel starter kit cost £200 and nobody sells smart TRV’s for £35! The total system cost for our Wiser setup would be £760 compared to £1375 for an equivalent rival system. We ruled out a number of systems due to their incompatibility with our existing setup, the level of re-engineering required or their inability to scale the solution. We hesitated in choosing other systems due to the size of the investment required or fear of the manufacturers ability to support products in the future. We had just about given up on the idea when we came across Drayton Wiser. Having only launched a few weeks earlier it seemed to meet all the requirements for our selection criteria. As a result we ordered the 3 channel kit for £199.99 and had it in our hands a couple of days later. Single and dual channel kits are available along with radiator valves and stand alone thermostats. The 3 channel kit includes a 3 channel Heat HubR controller, two room thermostats with mounts for fixing to a wall or stands for table tops. Batteries are included. The hub is fitted with an OpenTherm module and a standard wall mount bracket. You get an installation guide that provides different wiring configuration diagrams as well as a homeowner quick start guide. Picture: The contents of the kit. A word of caution – mains voltages can kill, cause serious injury or equipment damage. Please ensure you are competent, adequately experienced or qualified to work with mains voltage, if in doubt enlist the help of a professional. The first stage of the installation process is to fit the brains of the system, the Heat HubR. 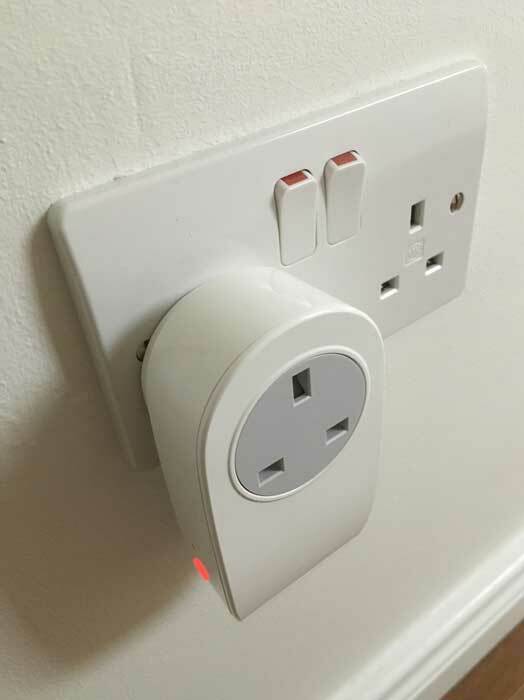 This is fitted with a standard wall connection plate that in many cases should be a straight swap allowing the user to unscrew the old controller and mount the new hub on the existing wall plate. The Installation guide will show you the wiring connections so you can validate the connections. In our case we were replacing a 4 zone controller with a 3 zone controller channel hub. The 4th zone on our traditional controller was managing the timing of an oil-fired range cooker which is separate from our heating system, this will be setup with a stand alone time controller after fitting the Drayton hub which will control the 3 zones. Diagram: A simplified schematic of our existing system. Our existing conventional controller back plate has more connections than the Heat HubR so we had to remove it and fit the plate supplied with the Heat HubR. Ensure you isolate any electrical supply to prevent the risk of electrocution. This was a simple process. The switched live from the controller went to two room thermostats and a cylinder thermostat which switch the live supply to trigger the boiler and the control valves of each zone. The two room thermostats were removed and the wires connected in a junction box to close the circuit. The cylinder thermostat stays in place to control the temperature of the hot water. Picture – Left: previous wall plate and right: Wiser wall plate. Once the electrical supply was reinstated the Heat HubR sprung to life. Drayton have built their app around the setup process. No need to read instructions or manuals, just download the app and it will walk you through the setup process. 1. Open the app and select create an account if this is your first time setting up a hub. 5. Once the thermostat has powered up the joining process can begin. This connects the Hub and the Thermostat via the systems IEEE 801. 2.4Ghz network. 6. Once joined to the network you assign a room to put the device in and map it to a channel on the hub. In our scenario it was the zone 1 entrance hall – channel 1 and zone 2 bedroom hall – channel 3. This step is repeated for each device. We screwed one thermostat to the location of the previous version in the entrance hall. The siting of the bedroom hallway way thermostat had to be moved closer to the hub to get a signal. 7. You then update the Hub’s WIFI with your local LAN credentials and connect it to your local network. 8. The next step is to create an account to allow remote access of the system when outside the home. Confirm your email address and then add the account address. 9. That’s it fully operational. It’s a very straightforward process. The thermostats are similar in size and shape to traditional thermostats. The devices have a clean and crisp design. They do not have physical buttons but capacitive touch buttons. Plus and minus increase and decreases the set point. Touching the circle will boost the heating, touching repeatedly will give different boost durations. Just beneath the circle there is a red LED behind an opaque window, this will flash if there is a problem. The screen (a 2.4” colour display) shows the target temperature in the lower right corner, the actual temperature in the center and the humidity in the top left. Top right displays the device’s battery level and the signal strength of the connection to the Heat HubR. If there is no signal you will see a red exclamation mark. When boosting the duration is shown in the middle of the screen. 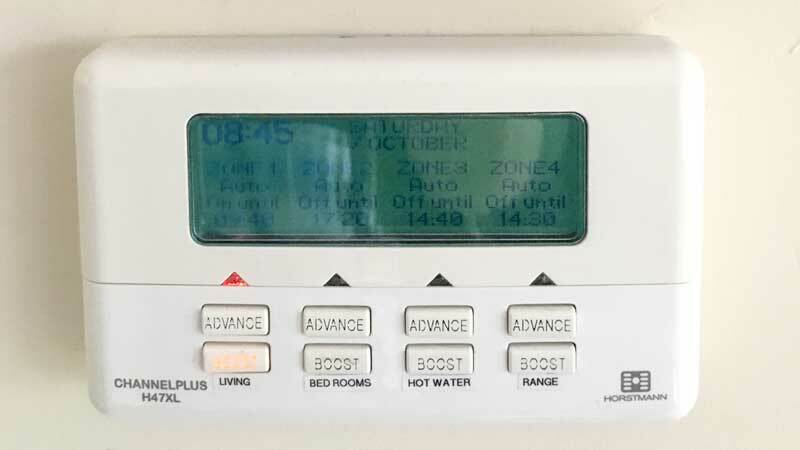 The zone 1 entrance hall thermostat is 10m from the hub and only achieved one bar on the signal strength indicator when initially connecting to the hub. We were surprised by this as the product specification stated 30m in free air, although we understand this can be affected by many factors. When we originally located the zone 2 bedroom hall thermostat it couldn’t get a signal and had to be moved to within 12m of the hub. 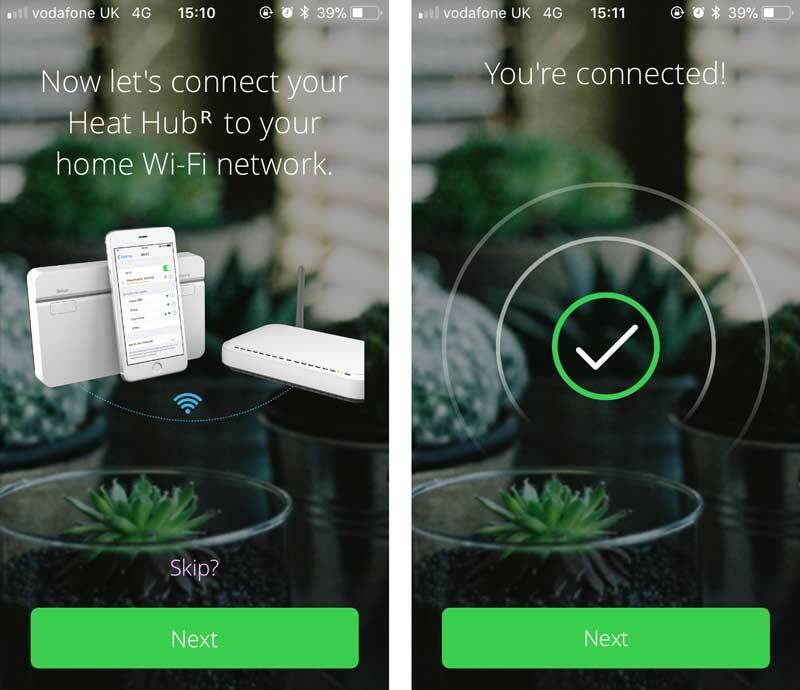 Having seen ‘Mesh’ referred to in the product specification we had assumed that the system would that capability to find a peer-to-peer connection back to the hub. After talking with the helpful Technical Support we learnt that while the wireless protocol used (a closed ZigBee system, as used by Philips Hue) supports mesh technology, the devices only connect in a star configuration to conserve battery life. Since we live in a bungalow the furthest device would definitely be outside the range of the hub. A plug-in range extender is available and we were sent one by Technical Support. The addition of the range extender has given us the extra distance required to allow us to locate the bedroom hall thermostat 15m from the hub. Unfortunately if we were to do a full Wiser implementation the furthest device from the hub would be 30m. Unless Drayton enable peer-to-peer networking on the plug-in range extenders we will be unable to cover all our radiators with Wiser. Since the range extenders are mains powered peer-to-peer networking should be enabled as there would be no concern over battery life. This would allow us to roll out Wiser across the entire property. Adding the range extender is straightforward. Press setup on the hub until it flashes, plug-in the extender and turn it on. The side button should stop flashing and turn solid when it has a connection. The device appears under ‘Other’ in the Room and Devices tab. Drayton have supported their new product launch with extended help desk hours that are now staffed 7 days per week – +44 (0) 333 7000 622. They can also be emailed customer.care@draytoncontrols.co.uk. Emailed queries get an auto response with a ticket number. We found both methods of contact provided quick and valuable feedback. The app is great at guiding you through the setup process. Once setup you can see the temperature of your devices and the temperature they are set to on the home screen. You can tell the system if you are home or away. In away mode the system drops the set point of the thermostats. Hopefully the Drayton team have geofencing in their development roadmap. From the home screen you can select each thermostat and from there you can see the actual temperature of the thermostat. The actual set point is shown just below you can see the current set point. You can change the set point by scrolling the temperatures along the bottom of the screen. Tapping the clock will allow you to boost the time by then selecting the appropriate duration. Taping the calendar will take you to the schedule where you can edit the temperature you want to achieve and when. The flame icon indicates the system is calling for heat. You have a maximum of eight set points where you can define the temperature required or turn the system off. When setting temperatures the length of the bar increases and the colour changes to indicate the temperature relative temperature. 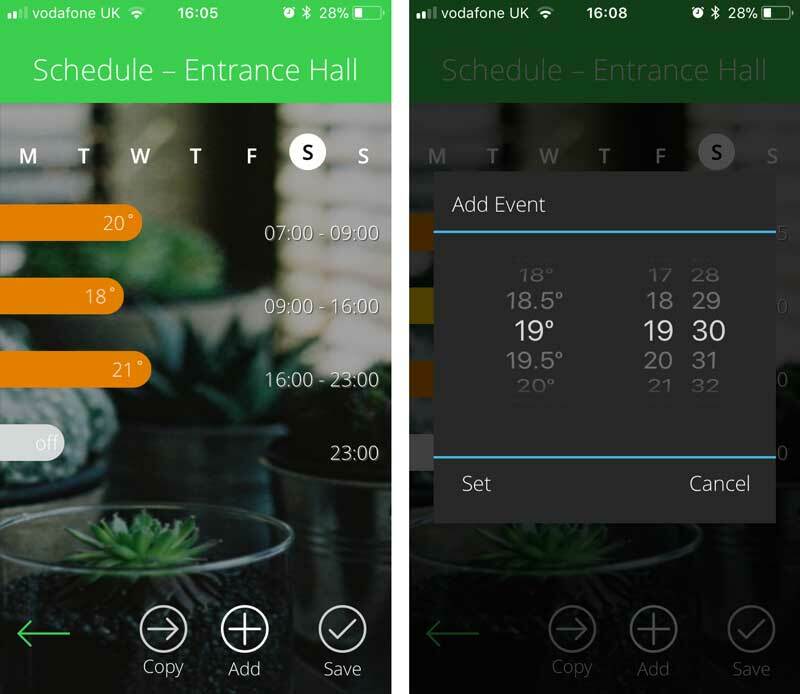 From the schedule setting screen you can copy the schedule across multiple days to save the effort of having to program each individually. One issue we did note is when making a schedule change the app screen didn’t update until we went to the home screen and back to the schedule. Hopefully a software update will remedy this. Going back to the main menu, taping the gears takes you to the setup options. Going to the rooms and devices page shows you a list of your rooms and the device assigned to each, including the device’s battery state and signal strength. We installed the app on two iPhones and two iPads in the house to provide easy access to the system. We had to use the one sign in on multiple devices as there is no option to assign multiple users. The feedback from the household was positive once we had the schedule fine tuned. Using the app and the hardware was easy to pick up and the kids were expert users in a short space of time. We turned on the Eco function to evaluate the system’s temperature compensation and how well it calculates when it needs to come on to get to the desired temperature at the required time. This is an important feature for us as our biomass boiler has a much longer heat up time compared to an oil or gas boiler. When setting up the app there was only options for oil, gas and electric heat sources, I’m not sure how this selection impacts the performance of the system as it learns but we selected oil. Peer to peer function enabled on the plug-in range extenders – essential for us to allow our full roll out. A network map or the ability to see how the devices connect to the hub or the range extenders. The ability to see the signal strength between the hub and the range extenders. The range extender looks suspiciously like a smart plug and you can hear a relay click when turning it on and off via the LED button. Can this functionality be added. An audit log file to show how long and often the boiler is being fired. The option of selecting Biomass from the heat source and the logic added to eco mode to allow for longer warm up times. The app instantly reflects schedule changes when made. Multiple user logins. Who keeps turning up the heating? Geofencing as well as the manual away mode switch. Ability to nominate a weather station on wunderground.com for very local data for the weather compensation function. The ability to see a timeline view of all the devices and when they call for heat. When scheduling our boiler we overlap the zone schedules to prevent unnecessary shut downs and startups. At present we plan it in a spreadsheet and then implement the timings in the app schedule. The ability to schedule, monitor and control from a web browser. The size of this list in no way should be seen as a bad reflection of the system, how many other users would have their own weather station, live in a long bungalow and have a biomass boiler – not your typical use case! This is a fantastic plug and play solution for many users and a cost-effective one at that. We did experiment with some Z-Wave components and TRV’s before but I’m glad I didn’t pursue this option based on what Drayton are now offering. We like it, we like it a lot so far. The hardware has a fresh design that’s unobtrusive. It was easy to set up and tailor to our needs. 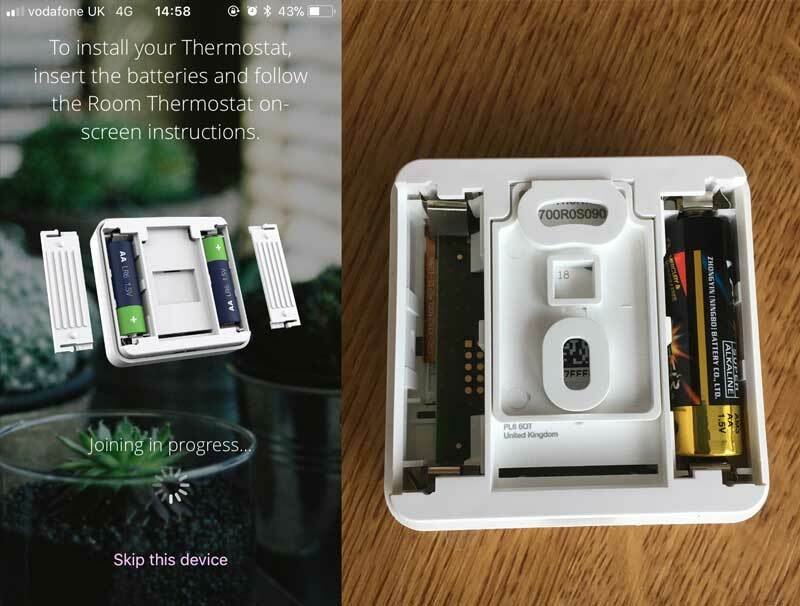 It has worked as expected and interaction with the system via the app or the thermostats has been straightforward and it didn’t cost a fortune. Would we recommend it, yes and we have, a friend has just ordered the single zone kit with two TRV’s which we will help install. Having set up the 3 Channel kit with the two thermostats we will go to the next level of control and add some of the Wiser radiator valves. As per the schematic we have 22 radiators, 18 of which are currently controlled by traditional TRV’s. The remainder are fixed valves typically on towel radiators as heat dumps. We will have to fully evaluate signal strength across the two zones to determine how many valves will have sufficient signal working on a star network.The other factor is trying to balance the cost of implementation but that is one of the factors that drew is to the Drayton solution, it can be phased in and is not too expensive. 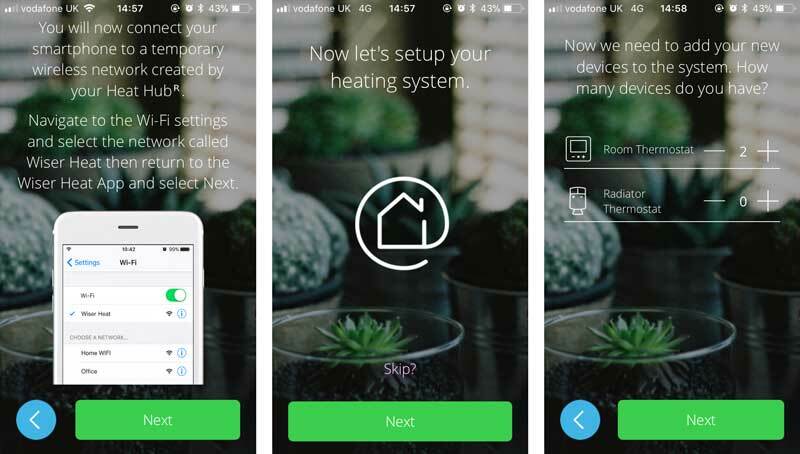 42 Comments on "Drayton Wiser Smart Heating Controls Review Part 1 – Step by Step Installation"
These systems seem to be coming on to the market thick and fast, one wonders if the market is large enough to support them all. There is definitely more choice than 12 months ago and I’m sure more will come. This has to be good for the consumer as manufacturers compete on cost and functionality for our hard earned cash. It probably is a big market when you think there are 27 million households in the UK. Even if 10% of these household could install a system with 6 radiators, then it’s a sizeable market. Some manufacturers will be unable to compete on cost or innovate quickly enough to gain or hold their share of the market and they will have to evolve accordingly. The big question, for me anyway, is whether the heating apps will talk to anything else. Big companies tend to want their own ecosystem, and smaller ones struggle to keep up. Interesting times indeed. 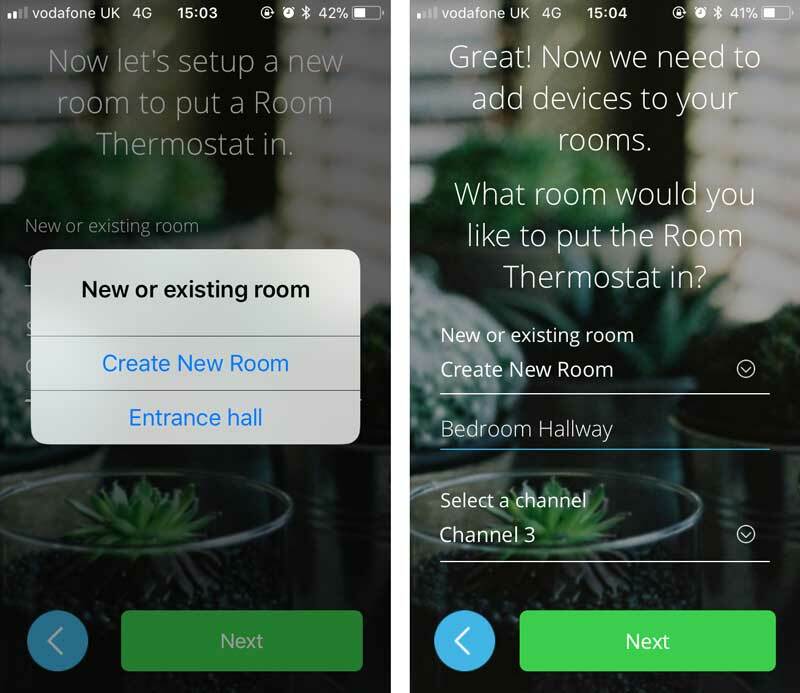 I also wonder if the thermostats should be included at all if all rooms have eTRVs, the app should be sufficient for scheduling while the hub does the control/interfacing. Useful as per below but at ~50-100 too much. We do need some cheap room thermometers (like the thermostats but simpler/cheaper) to serve as room temperature sensors away from the radiators. eTRVs themselves then could be simpler actuators only without control/sensors. 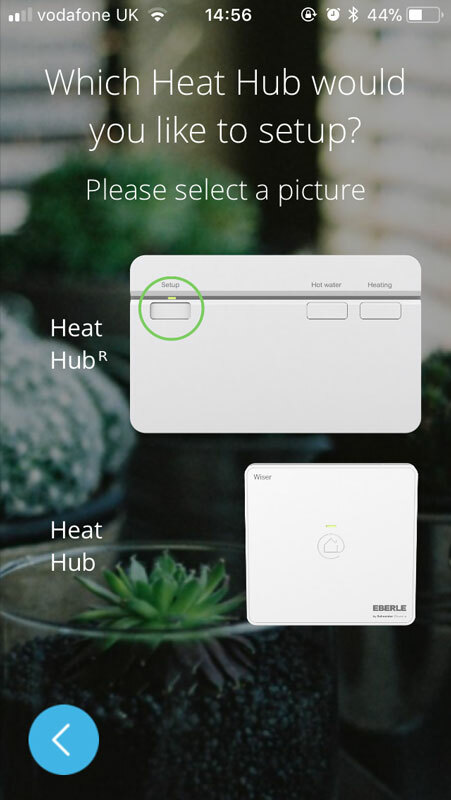 Smart heating systems are the future and if your systems are not scalable then the big brands like KNX and DALI will just viz past and capture the residential and commercial markets. I like this system and also am trialling it using the “hub plus 2 eTRV” kits. So far though my big problem is signal strength, I’m really struggling. I almost need line of sight to be confident about a signal. My understanding from tech support (who are great btw) that a firmware update will increase the thermostat and TRV transmission power. But even so I’d back up the requirement that the range extenders connect in a mesh for the system to be workable for me. The entire supply channel seems out of stock for the TRV heads so I guess that a number of early adopters of the kits aren’t having comparable signal issues. 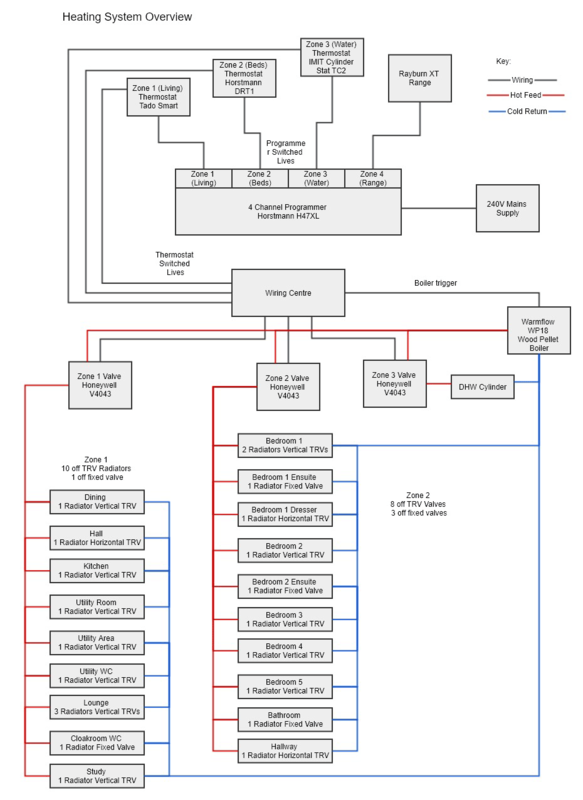 From your original schematic, how does this compare to the Tado system? As it seems to be rather similar in functionality and setup. Would you maybe recommend a swap from Tado to Wiser? A valid point, I hate the thought of independent eco system ‘islands’. I had hoped for a manufacturer to come up with an affordable and extensive Home Automation platform but that is still to arrive. I opted for Drayton Wiser for their deep domain expertise in heating control systems and the technical backup from Schneider Electric. I believe there are plans to release an API so hopefully there will be the ability to interface with other systems in the future. It appears Schneider Electric produces other home automation hardware so fingers crossed we see more Wiser components being added. I’ve helped install a second system for a friend and signal strength was a concern in that scenario too. It was low but it worked. Unusually a radiator valve 6m from the hub had a lower signal than one twice as far away. Hopefully Drayton address these concerns quickly. I’m sure they are trying to balance transmission power with battery life and polling frequency. I agree any contact with tech support has been good which is far from typical! I ordered another radiator valve today from Screwfix for £35 and it will be delivered on Friday, so not sure how widespread shortages are. Your comment made me smile. I sent the same diagram to Tado support and they told me they couldn’t support what I was trying to do. I thought it could but they told me no. 1. A Wiser actuator is £35 vs £59 for Tado so cost of implementation will be much less in my case, £500 less! So ignoring styling and other features Wiser got my vote, but note some concerns over signal strength on Wiser kit. You raise some interesting points. There does seem to be some fluctuation in pricing. The prices have stayed fixed at Screwfix so still good value. You are right, you could do without a thermostat if you had all your radiators fitted with the Wiser valves, just use the app for control. There doesn’t appear to be an option of buying a hub on its own or bundled with just radiator valves. The cost of the thermostat as an individual item isn’t too different from the cost of 2 radiator valves. I’m sure Drayton thought long and hard about what functionality to put in the radiator valves. There are no fancy screens, menus, buttons etc to push up the costs. Perhaps a future option may include the addition of individual heat sensors either on the Wiser platform or via IFTTT or similar platforms. 1. How the UFH is controlled? 2. What currently triggers the boiler to fire? Signals from controllers or water temperature in the Megaflo? 3. How is the water pumped around the three circuits? Individual pumps or via a manifold/valve arrangement and a single pump? It could be as simple as installing a single zone controller for just the radiator circuit or that could be oversimplifying it based on the answers to the questions above. I’m afraid that I’ve given up. I really wanted the Wiser kit to work as it’s inexpensive, its ergonomics and appearance seem well designed, Technical support was great and I liked that it was designed by people with a tradition of heating control. (And their instructions were great). However, even after Wiser sent me a range extender it was clear that range would not be acceptable. The range extenders also connect in a star network. If they were mesh it might have worked (however, I guesstimate it would take 6-7 to give me whole house coverage), but at the moment they’re not. I thought that I’d try Tado as their technical support indicated that all their devices connect in a mesh. Over the weekend I put in a 21 TRV, 10 zone Tado system. It’s 60% more expensive than the Wiser would have been (not pricing any Wiser range extenders) but no connection problems and so far it’s working perfectly. Using the standard plate was a master-stroke IMHO especially if hot-water/3-channel is required; more UK focused? Individual wireless relays are more flexible not everyone can re-do the wiring and as they cannot sit next to each other (interference) install can get complicated quickly. Having the hub/controller on standard plate also ensures it’s always mains powered so no dock/charger required. Display thermostat can thus last far longer on batteries. Only issue is that on its own seems to be about ~100 not cheap. I don’t see a hot-water cylinder sensor aka LM641/HTS3 replacement – I guess it still relies on that for temp control. Retrofit one of the thermostats? The range is the only issue stopping me ripping my system and changing to this – and even make some money back in the process 😉 – perhaps 868MHz has better range efficiency plus I wonder if all the WiFi congestion on 2.4GHz may not be helping. I can detect about 40 APs in my area most on 2.4 naturally. One thing I’d like to see on any system – is configurable update times – if I want my thermostat/eTRVs update every 5-10 seconds and burn through batteries that should be my prerogative! IMHO zone temp updates should force immediate temperature/action updates from thermostats/eTRVs – waiting minutes for updates is a bit ridiculous with bi-directional protocols. I don’t think there should be a problem using these adapters. It they work with a conventional TRV then they should work with the Wiser Radiator Thermostat. Before spending any money perhaps talk to the helpful Drayton Tech Support team on 0333 7000 622 or drop them a mail customer.care@draytoncontrols.co.uk. They ship the M30 and Danfoss type adapters with the Thermostats but I believe they have other types available. Firstly glad you got a system running. Room by room zoned heating does make a big difference. Range appears to be a real concern for many installations. I’ve put in two systems, I know it wouldn’t cover my entire house on a star network configuration hence my request on the wish list to enable mesh networking on the range extenders. I helped a friend install a system in his home and it wasn’t a huge area and the signal strength was low on devices only 6 meters from the hub. I hope Dayton prioritise this concern otherwise they may lose more customers. Is it as simple as enabling mesh networking? I understand their desire to preserve battery life but at least give the customer the option of choosing star network and longer battery life or mesh on reduced battery life. Annual battery changes seems typical on these type of devices and I could live with that. I like the kit and the cost but if it doesn’t work reliably then cost doesn’t matter. Let’s see what they do. The base plate should make things easier in theory but having checked out friends and relatives setups it would fit in 1 in 10 times, although this sample may not be representative. I believe the valve design is ideal. It’s simple just like a traditional TRV. Some of my valves are out of sight so we wouldn’t see the read outs easily. The reaction when someone comes into a room is not to ask what temperature is it but to say it feels cold/hot and adjust according. If you need to know temperature check the app or ask Alexa – more of this in the next instalment. I prefer the lower cost vs the on valve features but other people will have different priorities. Water temperature needs to be controlled by a cylinder stat. The system is a simple on/off scheduling for hot water. Having used the system for a few weeks I’ve had lots of ideas which I added to another wish list in the next instalment, this will include advanced user configuration for things like polling frequency. The number one issue for Drayton to address is the range and signal strength concerns. I have used Heat Genius with no problems. That uses Zwave in a mesh configuration. There are now supply shortages on Screwfix. They are advising a one week lead time before new stock is available. Demand is greater than supply. They will be putting on the overtime at Drayton! Can you tell me what the minimum graduation is on the set temp for the room stat and the TRVs? I am used to a Drayton Digistat +3 that has a 0.1 degree graduation that I find useful. Really interesting review and I’m very tempted by the product. I have used the Drayton MiGenie product for a couple of years, but then previous experience with this product has burnt my fingers. Promises about IFTTT integration and geofencing have failed to materialise. No compatible TRV’s either. It has been as if the MiGenie was a beta test. Don’t expect improved range extenders. What you have now is what you’ll have full stop. The system has gone down many times. This is a problem with Drayton’s servers and not locally, however there is no local system in place. So if their servers go down or they stop supporting the product, you cannot use it. Thus turning the ‘smart system’ to an overpriced dud with standard basic controls from the unit itself. I shall sadly be ‘Wiser’ and now look at another solution…tempted by the Tado. Disappointed that I can’t justify supporting a British company, but then it hasn’t supported its customers. Sigh. Heat Genius is british, is based around a Rasberry Pi and works well for me. Not sure about miGenie, but my Wiser has worked flawlessly so far. It supports local connectivity through WiFi so if the connection between the hub and the cloud is lost, I can still operate the system via my phone when at home. TRVs are great, both in design and functionality, and Alexa works extremely well, including multi room support. As they have demonstrated that they can integrate a service like Alexa so well, I’m hopeful they can do the same with IFTTT. I purchased my Wiser from Amazon and unfortunately the room thermostat was defective and failed after 2 hours(yesterday). Tech support were fantastic and the new room thermostat is due tomorrow. One question, on the TRV’s, has anyone installed these on radiators where the TRV is on the exit flow from the radiator? I don’t see the value of this and have only just found this out about my heating. I’m thinking the TRV should be on the input feed from the boiler? I’ve seen systems where it’s on the exit flow but how is the TRV effective if closing the valve on the exit and not entry (to stop the flow from the boiler?). Other than that most comments are spot on with the wish list, I did have an issue with setting the schedule as it wouldn’t take but eventually after leaving a minute after changing the setting it took. Impressed with the system up to now and its ease of installation and use though. Any tips on the TRV’s as above other than swapping the valves (bigger job than I wanted). Most modern TRV’s are bidirectional and can be fitted on the flow or return side of the radiator. The body of the valve will have a bi directional arrow on it to indicate this. Best practice is to fit TRV’s on the flow side but I wouldn’t worry about changing them if they are bi-directional and on the return side. If the valve body has an arrow pointing in one direction then it should be on the flow side. If a single direction valve is fitted on the return side then you could get a lot of noise from the valve and poor sealing of the valve seat. I’ve installed the Wiser system with 2 WISER TRV’s and the room thermostat. Very impressed. Screfix have now received a supply of TRVs, so I’ve now ordered a bunch for all the radiators. Must the supplied room display thermostat be used in a room without any TRV installed ? The thermostat is located in the lounge. I ask since I am currently heating the lounge radiator at times of the day when there is no one in it. So a waste of heat. Must I (technical reason please) have the supplied thermostat display unit be AND an open radiator be configured ? I have teh Wiuser heat system up and runngin and apart from still tuning it, I find it works well. has anyone had any problems getting Amazon Alexa to connect to it? So far it is not finding the devices and I have teh WiserHeat skill installed. Probably best to contact Drayton direct for a technical explanation. I believe you can have a radiator TRV and a room thermostat in the same physical room and the same Wiser room and the room thermostat temperature sensing takes priority over the TRV. I have only had a couple of instances of adding Alexa and it worked perfectly straight away with no fuss. If you are stuck try contacting Drayton customer support. Hi Mark, great review, the system looks great. Just wondering when we can expect part 2 of your review? Thanks! Interesting review thanks. On the back of this I have just installed a 2 channel Wiser kit in our house. Only issue is that the Wiser TRV heads don’t fit our old Altech ones so I need to buy some adapters which are about £10 each – seems a bit excessive! I did do a range check and it appears that the TRVs have a better range than the room thermostat. Connected up to an Amazon Echo 2 very easily. Looking forward to reading Part 2 next week. 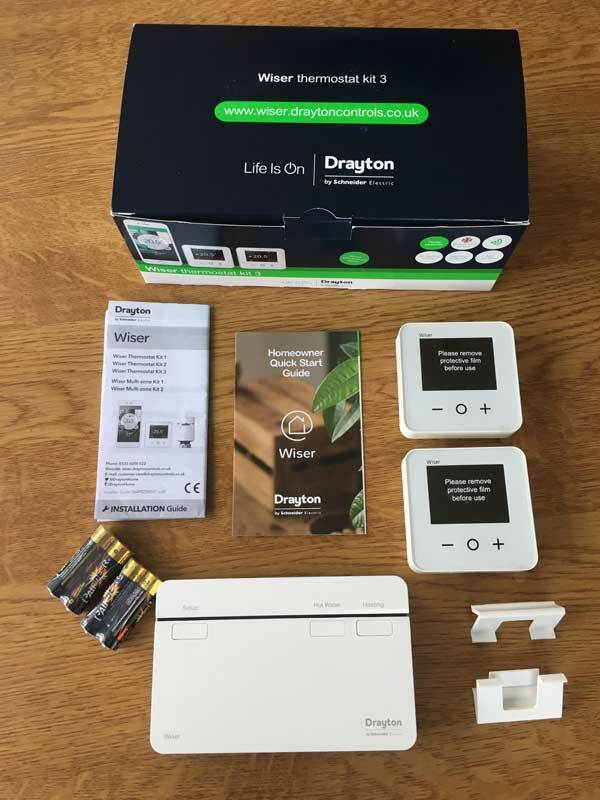 See https://www.automatedhome.co.uk/hvac/drayton-wiser-smart-heating-controls-review-part-2-installation-update.html for some interesting feedback from Drayton on this review, it addresses some of the points raised and the feedback from the comments above. The thing that greatly concerns me about many of these products is the reliance on a internet server ran by these companies. If at some point in the future that server is turned off there goes your smart heating system. Why can’t we have something completely self contained and runs without outside assistance ? Hi, anyone managed to work out how to have trv,s in multiple zones? Ie have them all in ine zone called house and then split into three zones, top floor, middle, ground and then a zone for when I’m working from home, offfice, Hall, kitchen, etc etc? Also anyone found an m28 to 1.0mm trv adaptor? I was rightly reminded of this point at the weekend when my LG smart TV flashed up a warning to say the YouTube app would no longer be supported. Wiser will work without needing to access the cloud. As long as you can access the hub over local WiFi then it will work. This is a good feature if you loose internet connection but in theory it means you could operate the hardware without the Wiser server. I know this cannot be said of all Smart Heating systems. Some of the current range of Drayton Lifestyle controllers have been around since the early ‘90s so hopefully Wiser will last just as long! Judging by the pace of technological change we will have to face the fact that at some stage it will be superseded. Drayton have now released the new revision firmware designed to improve range. Will be interesting to hear what impact this makes to users that experienced problems. The new Screwfix catalog (Jan 2018) is just out and I see the smart TRVs are now £40 vs the £35 when the article was written. They are available for the same price in Amazon. £35 did seem too good to last!